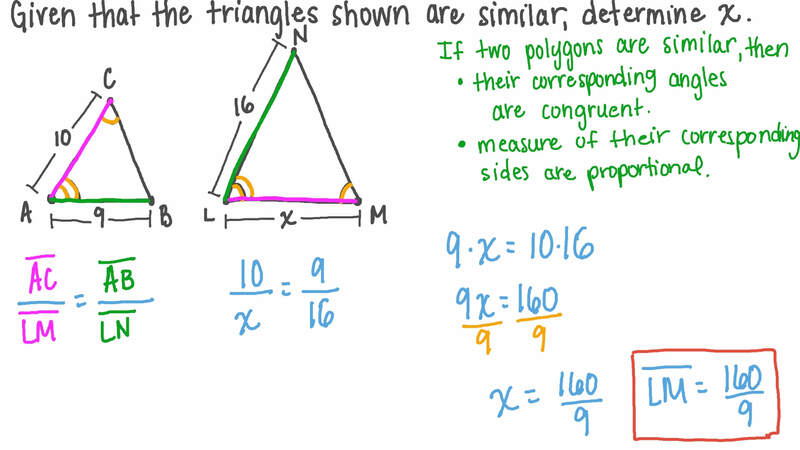 In this lesson, we will learn how to use proportions in order to identify similar polygons. Are the two polygons similar? Given that the triangles shown are similar, determine 𝑥 . Is the polygon 𝐴 𝐵 𝐶 𝐷 similar to the polygon 𝐸 𝐹 𝐺 𝐻 ? 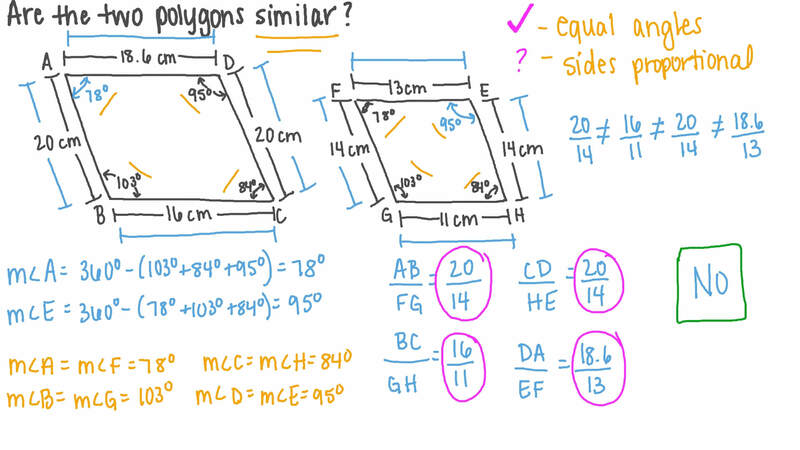 Which of the following statements correctly defines similarity for polygons? A Two polygons are said to be similar if their corresponding angles are congruent and their corresponding sides are in proportion. BTwo polygons are said to be similar if their corresponding angles are complementary and their corresponding sides are equal. C Two polygons are said to be similar if their corresponding angles are equal. 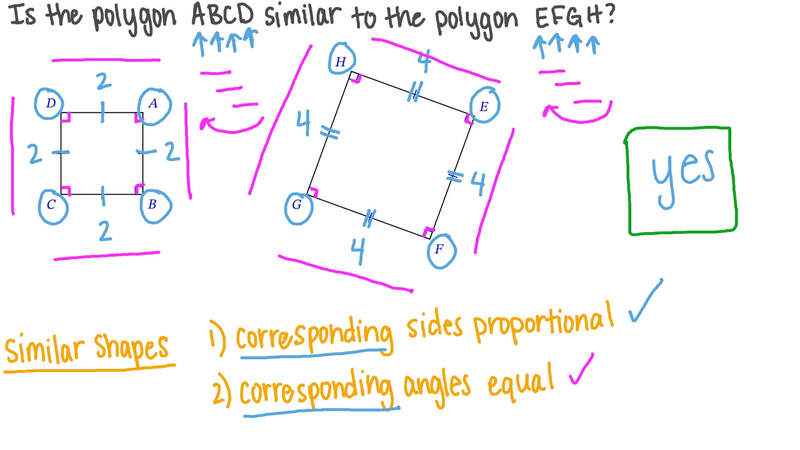 D Two polygons are said to be similar if their corresponding sides are congruent. E Two polygons are said to be similar if their corresponding sides are equal. Find the lengths of 𝐴 𝐵 and 𝐴 𝐶 rounded to the nearest tenth. 𝐴 𝐵 𝐶 𝐷 ∼ 𝑍 𝑌 𝑋 𝐿 and the perimeter of 𝐴 𝐵 𝐶 𝐷 = 1 7 7 c m . Calculate the scale factor of similarity of 𝑍 𝑌 𝑋 𝐿 to 𝐴 𝐵 𝐶 𝐷 and the perimeter of 𝑍 𝑌 𝑋 𝐿 . The ratio between corresponding sides of two similar triangles is 1 0 ∶ 9 . If the length of the base of the larger triangle is 19.7, find the length of the base of the smaller triangle rounding the answer to the nearest tenth. The ratio between the areas of two similar polygons is 1 ∶ 4 . Given that the length of one side of the smaller one is 8 cm, calculate the length of the corresponding side of the bigger one. In the figure, given that the two triangles are similar, work out the value of 𝑥 . If the corresponding angles in two triangles are equal, then the two triangles . If the scale factor of two similar polygons equals 1, what can you say about the polygons? A polygon has sides 2, 4, 3, 8, and 4. A second similar polygon has perimeter 31.5. What are its sides? If polygon 𝐴 and polygon 𝐵 are both similar to a third polygon, then polygons 𝐴 and 𝐵 are . Consider two similar polygons 𝐴 𝐵 𝐶 𝐷 and 𝑋 𝑌 𝑍 𝐿 . Which angle in 𝐴 𝐵 𝐶 𝐷 corresponds to ∠ 𝑌 ? Is rectangle 𝐴 𝐵 𝐶 𝐷 similar to rectangle 𝑋 𝑌 𝑍 𝐿 ? Any two triangles are similar when their corresponding are proportional. If the polygon 𝑀 1 is similar to the polygon 𝑀 2 and the scale factor from 𝑀 1 to 𝑀 2 is positive and less than 1, then 𝑀 1 is 𝑀 2 . Consider the points 𝐴 ( 3 , 5 ) , 𝐵 ( 3 , − 5 ) , 𝐶 ( 5 , − 5 ) , 𝐷 ( 5 , 5 ) , 𝑊 ( − 3 , 8 ) , 𝑋 ( − 3 , 2 8 ) , 𝑌 ( 1 , 2 8 ) , and 𝑍 ( 1 , 8 ) . Is the rectangle 𝐴 𝐵 𝐶 𝐷 similar to the rectangle 𝑊 𝑋 𝑌 𝑍 ? Are these two triangles similar? Are these two polygons similar? Is polygon 𝐴 𝐵 𝐶 𝐷 similar to polygon 𝐺 𝐹 𝐸 𝑋 ? Given that 𝐴 𝐵 𝐶 𝐷 ∼ 𝐸 𝐹 𝐺 𝐻 , determine the length of 𝐸 𝐻 .